Fig. 3. 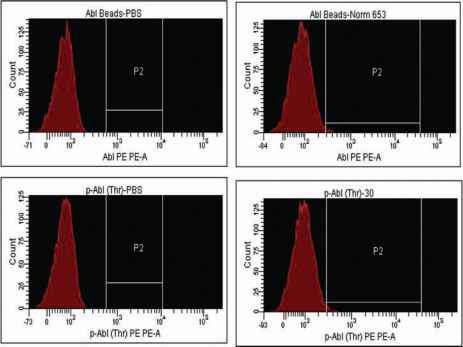 Detection of BCR-ABL protein and its phosphorylation. 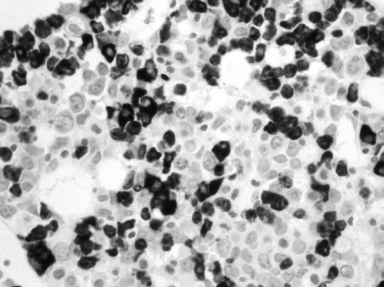 Plasma samples prepared from peripheral blood plasma of a normal subject and an untreated chronic myeloid leukemia patient were incubated with anti-BCR coated beads, followed by incubation with antibody directed against ABL (upper row) or phosphorylated Tyr245 of ABL (lower row). PBS served as a negative control. beads (1:10 with blocking buffer) with 5 ^L anti-mouse PE for 15 min at room temperature in the dark. The beads are washed and resuspended in 500 ^L flow PBS for flow analysis. An example of the result is shown in Fig. 2. 2. If normal samples exceed 5% shift more than PBS controls, newly conjugated beads are recommended. If all samples display a 100% shift more than normal, reblock and quench beads before use. If the scatter profile of beads is dispersed and excessive noise is present in the forward vs side scatter plot, there may be contamination in the blocking/dilution buffer. 1 Kantarjian, H. M., Talpaz, M., Cortes, J., et al. (2003) Quantitative polymerase chain reaction monitoring of BCR-ABL during therapy with imatinib mesylate (STI571; gleevec) in chronic-phase chronic myelogenous leukemia. Clin. Cancer Res. 9, 160-166. 2 O'Brien, S. G., Guilhot, F., Larson, R. A., et al. (2003) Imatinib compared with interferon and low-dose cytarabine for newly diagnosed chronic-phase chronic myeloid leukemia. N. Engl. J. Med. 348, 994-1004. 3 Deininger, M., Buchdunger, E., and Drucker, B. J. (2005) The development of imatinib as a therapeutic agent for chronic myeloid leukemia. Blood 105, 2640-2653. 4 Gorre, M., Mohammed, M., Ellwood, K., et al. (2001) Clinical resistance to STI-571 cancer therapy caused by BCR-ABL gene mutation or amplification. Science 293, 876-880. 5 Muller, M. C., Gattermann, N., Lahaye, T., et al. (2003) Dynamics of BCR-ABL mRNA expression in first line therapy of chronic myelogenous leukemia patients with imatinib or interferon alpha/ara-C. Leukemia 17, 2392-2400. 6 Marley, S. B., Lewis, J. L., Schneider, H., Rudd, C. E., and Gordon, M. Y. (2004) Phosphatidylinositol-3 kinase inhibitors reproduce the selective anti-proliferative effects of imatinib on chronic myeloid leukaemia progenitor cells. Br. J. Haematol. 125, 500-511. 7 Albitar, M., Do, K. A., Johnson, M. M., et al. (2004) Free circulating soluble CD52 as a tumor marker in chronic lymphocytic leukemia and its implication in therapy with anti-CD52 antibodies. Cancer 101, 999-1008. 8 Rogers, A., Joe, Y., Manshouri, T., et al. (2004) Relative increase in leukemia-specific DNA in peripheral blood plasma from patients with acute myeloid leukemia and myelodysplasia. Blood 103, 2799-2801.